Gordon Ramsay's aim is to get us all cooking up a storm and sitting down at the table with friends and family to share lunch on Sundays and at other leisure times. In the second series of "The F Word", his highly acclaimed topical food programme, he visits people all over the UK of all ages, backgrounds and ethnic origins to help them cook up a meal for family and/or friends. These range from traditional Sunday roasts to lighter summer fare, from easy 30-minute meals to Italian, Indian and Moroccan influenced family feasts. As always, Gordon is there to help the home cook at every stage - buying the right ingredients, preparation and serving and helping to co-ordinate the cooking of several dishes to arrive on the table simultaneously. This TV tie-in book takes all the dishes served on the programmes and arranges them into 25 menus, each featuring a starter, main course and a pudding, plus an invaluable timetable and all sorts of helpful culinary hints, such as carving and what to do when things go wrong. 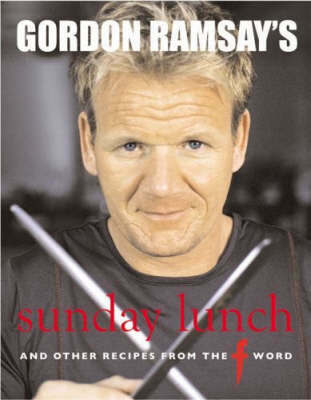 For those who want to pick and choose, there are alternative recipe and menu suggestions plus invaluable expert advice and techniques from Britain's top chef, making this a must-have purchase for all Gordon Ramsay fans.